I love that Quick Breads just seem to scream “good home cooking” don’t you? They’re great for all kinds of occasions: when company is dropping by, for brunch, or maybe to take to the office or to a family who needs a bit of a boost. This would make anyone feel better, at least while they’re eating it! 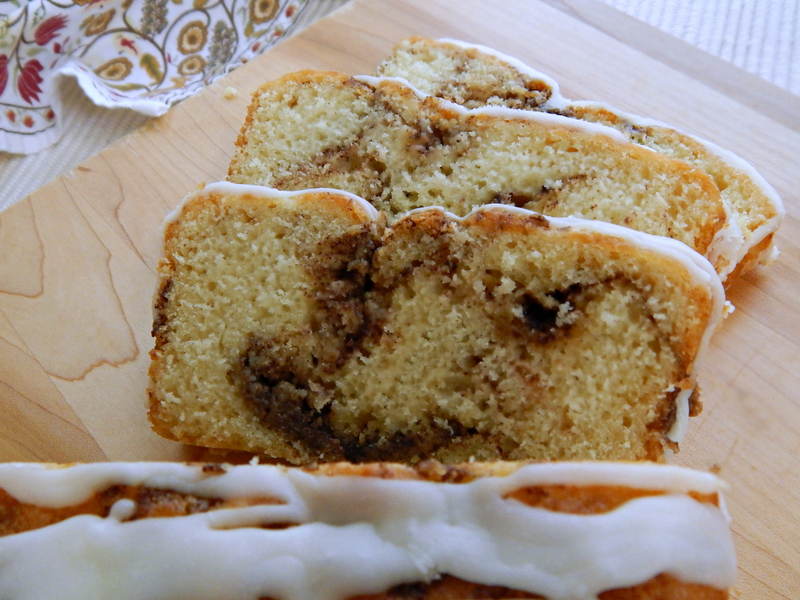 This Cinnamon Swirl Quick Bread – amazing! It’s like eating a cinnamon roll combined with a cake. It’s very moist and the whole thing is a contrast in textures and flavors. I’ve kinda fallen in love with it. I might say “love” a lot on my blog. I’m guilty, I know, but that’s only because I don’t post something unless I love it. 🙂 But this one I really, really, really love. Really. lol! While quick breads are better wrapped tightly in foil or plastic wrap and refrigerated overnight – we couldn’t wait. This was so good with its cinnamon swirl and that lovely glaze that we had to dig in. Heck, when the house was filled with the cinnamon aroma, it was hard enough to wait til it was cool enough to glaze. You’ll notice I don’t have a photo of the whole loaf, lol! It was pretty, though. This recipe makes two loaves which is always a good thing. One to eat and one to share or one to eat and one to freeze. Quick Breads freeze very well without glaze or frosting; just wrap in plastic and then in foil. Thaw overnight in the fridge. You’ll notice the ingredients are super easy to cut back if you just want one loaf, though. You can save on baking goods if you shop strategically. I pick up more than I need during holiday sales. And use coupons. All flour items go in my freezer for three days, & butter (the pricey item, here) keeps well frozen in its original wrappers for months. Eggs are good for several weeks past their “buy by” date. Aldi has great prices on flour, butter & eggs, too. enough milk or buttermilk to thin to desired consistency, 1 teaspoon to a tablespoon or so. Mix all ingredients and put in a ziploc bag. In judging the amount of liquid, remember that this mixture won’t be fully thickened until cool. Wait until nearly cool then cut off a small corner and squeeze across the tops of the cooled loaves. Preheat oven to 350° F. Spray or grease 2 9 x 5 loaf pans, line bottom with parchment and spray or grease parchment. Combine dry ingredients and whisk together in a bowl. Set aside. In mixing bowl, cream butter until light and fluffy, about 4 minutes. Add sugar and beat until incorporated. Add eggs, one at a time, combining well after each. On low, add sour cream, buttermilk and vanilla. Scoop 1/4 of the batter into each loaf pan; do not smooth out other than to make certain that the whole bottom is covered. Sprinkle with about 3/4’s of the Swirl & Topping portion of the recipe, dividing it between the two pans. Carefully spread with remaining batter, smoothing the top. Using a butter knife, dip the knife in and out of the batter, using a lifting motion and running the knife two to three inches across or back and forth randomly. Place the tip in a different area each time. Sprinkle the top with the remaining Swirl & Topping mixture. Bake about 50 minutes or until a toothpick inserted in center comes out clean. Cool 10 minutes before removing from pan, peeling off the parchment and setting on a wire rack to cool completely. When cool, drizzle the glaze over the top, back and forth in an attractive striped pattern. This entry was posted in Click here for Fabulous Food Posts and tagged Bread, Breakfast or Brunch Dish, Easy Recipe, Frosting, Frugal Hausfrau, glaze, Quick Bread, Sour cream. Bookmark the permalink. Wow… 2 great quick breads shared at Fiesta Friday in one week… aren’t we the lucky recipients. 😛 Thanks for bringing a delicious variety to the party this week! Thanks, Nancy! This one is truly outstanding and will be one I’ll make over and over. 🙂 Thanks for hosting, and happy FF! I bet the house smells wonderful while this is baking! I love cinnamon! It’s so wonderful, isn’t it? Can’t wait for the cooler weather to arrive to bake stuff like this. I kept going back and sneaking a smidge here and a smidge there, it’s dangerous!! I want to make it again, but I just can’t!! I couldn’t seem to stop myself from eating “just a little slice” over and over!! Ha ha ha!! I have the problem of baking sitting on the kitchen counter– and every time I pass through the kitchen, I take just a nibble! I’m sure this bread would meet that end! 🙂 ha! glad to know I’m in esteemed company!! I think I would prefer how this one came out, I do like a really moist cake/bread. It looks delish Mollie! Mmmmmm! There is no way I could wait until the next day. Smelling the cinnamon baking would have me waiting for the timer with knife in hand 😉 Good thing there is a loaf for the next day too! What was I thinking!!!??!! lol! You have the best recipes, love this quick bread. Good to know that it freezes well. I’ve got to try this. Thanks! I should have wrote to freeze without the glaze!